I guess I should start out by stating that I do not find anything in this bit of junk mail to be the least confusing or misleading. Do you? 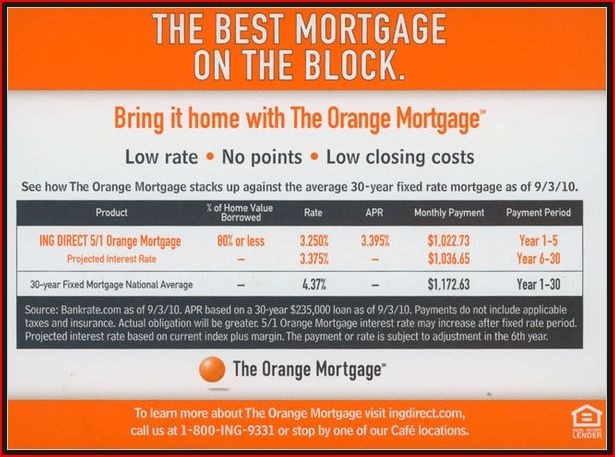 5/1 Orange Mortgage interest rate may increase after fixed rate period. Projected interest rate based on current index plus margin. The payment or rate is subject to adjustment in the 6th year. I think they meant “and” rather than “or” in that last sentence, but this hits all the important highlights. The loan has a fixed rate for five years, then it may get more expensive. They may not call it an ARM, but they own up to the (fairly obvious) drawbacks of it. And these sentences are a significant portion of the total text on the card, which ends by encouraging the reader to “learn more” about the product by calling or visiting a website. I guess I ought to disclose that I took out this particular mortgage from ING last March. Rates were higher then. (In fact, they have gone down further since this card was printed at the start of September.) So there wasn’t very much chance I would have been confused by the ad. But would anybody? Ron Lieber at The New York Times thinks so. In his Your Money column this weekend, In Mortgage Ad, Two Wrongs Don’t Make a Right, he affects a tone of exasperated outrage. One of the most important lessons of the mortgage collapse is that potential borrowers need clear explanations of exactly what kind of commitment they are making. This ad, which he calls “very 2005” is a violation of that expensively learned lesson. Lieber’s two wrongs refer to the fact that ING did not use the phrase “adjustable rate mortgage” and that it did use an unrealistically rosy projection of what the interest rate might be in years six through thirty. Am I to infer that if the card called the product the “ING DIRECT 5/1 Orange ARM” but skipped the bits about how the interest rate could go up, Lieber would be happier? And as for the projected interest rate being too low, Lieber acknowledges that, wrong or not, ING deserves no blame for it. Fed regulations specify how those projections are to be made, leaving no leeway to the lender. Basically, the current rate is extrapolated out. If the adjustment formula is LIBOR plus 2.75%, and that would give you 3.375% today, then you must project 3.375% for year six and beyond. As I said, I refinanced with this ING product in the spring. It took months to arrange. I feel like I signed my name a hundred times at the closing and left with several pounds of paper, most of it disclosures of one kind or another. Mortgages are big complicated things. Outrage that not enough of the details of the mortgage terms are disclosed in a piece of junk mail, or any advertisement is, well, utter nonsense. The card also neglected to mention that ING will escrow for property tax, insist that you have homeowner’s insurance, and may foreclose if you do not make the payments. Aren’t those things important too? The postcard tells a consumer the single most important fact about the mortgage: the rate. The rest of the details are quite standard, assuming that you know what a “5/1” mortgage is. If you do not, you will find out all about it soon enough. That is why we have closings with all that paper and why the process is a lot more involved than buying something with a credit card. The idea that borrowers could be denied “clear explanations of exactly what kind of commitment they are making” is absurd. I suppose a person could argue that advertising for mortgages, or any complex financial thing, should just be banned to prevent consumers from getting the false impression that they understand what is going on. In as much as that would decrease competition, that would not help much. Or perhaps complicated things like ARMs should be abolished. I suspect that Lieber would be sympathetic to this idea. There are two problems with it. First, even a 30 year fixed is complex animal that needs a lot of explaining to the uninformed. And second, removing ARMs from the marketplace makes most borrowers worse off, since they must pay higher rates on fixed mortgages. As I have argued before, ARMs should almost certainly be more popular than they are. Some bits of personal finance are complicated. That is an inevitable side-effect of living in a wealthy and advanced society. And it means that some important things cannot be fully described on the back of a postcard. I do think the ‘projected’ interest rate for years 6-30 being based on todays rate is stupid and useless. I don’t know why the government would mandate that, it just causes any such projection to be meaningless and/or misleading. I think it would make more sense to require a lender to disclose the maximum possible interest rate for an ARM and how fast it adjusts. Thats useful information. I’m sure they could fit that on their postcard. As for the ING mortgage, I remember reading in the past that a balloon payment of the remaining mortgage principal was due at the end of year 5, unless you qualify for a refinance w/ING at their current rate (or something like that). Have they done away with that? Problem w/an ARM, from what we know now, is that when the rate adjusts, the borrower may then be financing at a considerably higher rate/payment…and if something terrible has happened to the borrower prior to the 5th year rate adjustment that would disquialify them from refinancing (home is ‘underwater’, long-term unemployment, medical emergency and bills, or bankruptcy), then they could be stuck in/a dire circumstance. But, of course, real estate can be a risky adventure. There is a whole lot of difference between an adjustible rate (based upon a predetermined formula) and having to requalify at a future date. This offer would scare me to death. I think that this it’s a very interesting concept and I agree with you. This post has truly enriched my science and experience, I’m happy. I found this site and I can share with you my observations and thoughts. If you have new solutions or ideas, please send me a message by email.